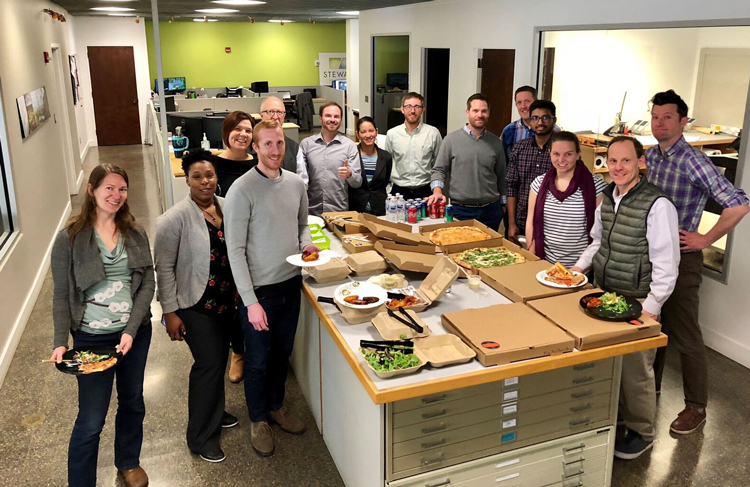 Raleigh, N.C. — Stewart, an interdisciplinary design, engineering and planning firm, raised $3,141 on Pi Day, March 14, to send a total of 12 elementary- to high school-aged students to engineering summer camps across North Carolina. The fundraiser was part of Stewart’s recognition of Pi and its impact on the world. Funds raised by employees were matched dollar for dollar by the firm and will cover the costs for 12 students to attend local engineering camps this summer, including NC State University’s College of Engineering Summer Programs, North Carolina A&T State University’s Aggie Enrichment Camps and UNC Charlotte’s Camps on Campus program. These camps provide informative activities for attendees ranging in age from elementary school to high school, to understand the importance of engineering, design and planning in everything around us and everything we do. From working with robotics to designing houses and bridges, camp attendees will have hands-on experience with fun yet challenging projects to enhance their skills and explore their future careers. The donation is the latest way Stewart is inspiring and supporting future engineers, designers and other STEM professionals. The firm endowed an annual scholarship in the civil engineering department at NC State University and sits on the board for NC State College of Design.